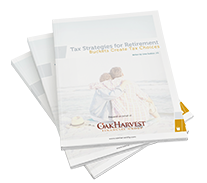 When your Oak Harvest Retirement Plan is finished and implemented, the commitment from Oak Harvest is just beginning. We hold ourselves to a high service standard. We call it "Five-Star Service," and we focus on providing it to all of our clients. Your primary advisor works together with a team of service specialists, which means you have a dedicated service team supporting your retirement vision! This team is composed of both primary and secondary client service specialists. This ensures someone is always immediately available for you to speak with when you have questions or need assistance. Your primary point of contact will be your Client Concierge, who acts as your direct contact for any daily service needs and can handle most requests. If you have specific investment or planning questions, your call or email will be routed to your advisor or the appropriate retirement planning or investment team who will provide a timely response. If it’s a unique situation that only your advisor can help with, he or she will return your call as soon as possible. This is usually the same day, but it’s always timely. Any requests for funds or specific investment or planning questions will be handled over the phone to verify your identity.